Bright golden straw color. Fruity aromas and flavors of baked peach, nougat, kiwi and melon rind, and grass with a silky, bright, fruity light-to-medium body and a smooth, medium-length finish with accents of lemon spritzed melon, apple, mandarin orange, and apricot pit and cantaloupe with no oak flavor. A light and juicy Italian white with tasty ripe fruit and an easy sipping style. Bottom Line: A light and juicy Italian white with tasty ripe fruit and an easy sipping style. 87 • Arosa NV Sparkling Moscato Rosé 7% (Italy) $.00. 85 • Bella Bolle NV Prosecco DOC 11% (Italy) $9.99. 88 • Bella Bolle NV Sparkling Red Dessert Wine, Italy 5.5% (Italy) $9.99. 87 • Bella Bolle NV Moscato d’Asti 5.5% (Italy) $9.99. 90 • Belletti NV Prosecco DOC 11.5% (Italy) $6.99. 88 • Bloom Jasmine & Rose Gin 40% (England) $34.99. 92 • Castillo de Albai 2012 Crianza, Rioja DOC 13.5% (Spain) $19.99. 94 • Castillo de Albai 2011 Reserva, Rioja DOC 13.5% (Spain) $13.99. 88 • Champs de Provence 2016 Rosé, Côtes de Provence 13% (France) $17.99. 93 • Champs de Provence 2017 Rose, Côtes de Provence 13% (France) $17.99. 84 • Coastal Cove 2016 Sauvignon Blanc, Marlborough 12% (New Zealand) $7.00. 83 • Conquista 2014 Reserve, Malbec, Uco Valley 14.5% (Argentina) $19.99. 87 • Finca Las Moras 2015 Bourbon Barrel Aged, Cabernet Sauvignon, San Juan 13.5% (Argentina) $19.99. 91 • Gran Conti NV Sangiovese, Sangiovese del Rubicone 12% (Italy) $9.99. 84 • Gran Conti 2015 Pinot Grigio, Veneto IGP 12% (Italy) $9.99. 92 • Gran Conti 2014 Montepulciano d’Abruzzo DOC 13% (Italy) $9.99. 90 • Grand Alberone NV Rosso, Italy 14.5% (Italy) $10.00. 88 • Grandi Mori NV Prosecco di Valdobbiadene 11% (Italy) $9.00. 87 • Grays Peak Vodka 40% (USA) $17.99. 85 • Grays Peak Meyer Lemon Flavored Vodka 30% (USA) $17.99. 84 • Greenall’s Wild Berry Gin 37.5% (England) $17.99. 91 • IL Tramonto Amaretto Liqueur 28% (Italy) $19.99. 88 • Landshut 2015 Riesling, Mosel 9.5% (Germany) $6.00. 87 • Le Grand Noir NV Brut Reserve, Languedoc AOP 11% (France) $11.99. 87 • Le Grand Noir 2014 Pinot Noir, Languedoc AOP 12.5% (France) $11.99. 86 • Le Grand Noir 2017 Rose, Pays d’Oc IGP 12.5% (France) $11.99. 92 • Paluzzi 2016 Moscato d’Asti 5.5% (Italy) $7.00. 86 • Paluzzi 2017 Moscato d’Asti 5.5% (Italy) $7.50. 86 • San Zenone 2016 Bianco, Delle Venezie IGT 12.5% (Italy) $6.00. 87 • San Zenone 2014 Toscana Rosso IGT 13% (Italy) $6.00. 84 • San Zenone 2017 Bianco, Tre Venezie IGT 12.5% (Italy) $6.00. 87 • San Zenone 2015 Toscana Rosso IGT 13.0% (Italy) $6.00. 87 • Sayanca 2015 Malbec, Mendoza 13.5% (Argentina) $6.00. 89 • Shadow Bay 2013 Reserve, Cabernet Sauvignon, France 13% (France) $12.99. 92 • Shadow Bay 2013 Reserve, Pinot Noir, France 12.5% (France) $12.99. 91 • Shadow Bay 2014 Reserve, Chardonnay, France 12.5% (France) $12.99. 86 • Villanella 2014 Pinot Grigio, Alto Adige 12.5% (Italy) $6.00. 87 • Villanella NV Pinot Grigio, Alto Adige 12.5% (Italy) $9.99. 85 • Whispering Hills NV Cabernet Sauvignon, Spain 12.5% (Spain) $4.99. 86 • Whispering Hills NV Merlot, Spain 13% (Spain) $4.99. 84 • Whispering Hills NV Chardonnay, Spain 12.5% (Spain) $4.99. 89 • Whispering Hills NV Moscato, Spain 10.5% (Spain) $4.99. 87 • Whispering Hills NV Pinot Grigio, Italy 12% (Italy) $4.99. 86 • Yes Way Rose 2017 Rosé, Mediteranee 12.5% (France) $13.99. Although red wines are a more famous entity in Italy, there are excellent whites produced in many regions throughout the country. 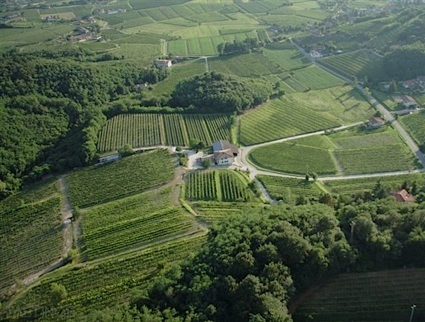 Two cool climate regions in the north that produce some of the finest examples are Alto Adige and Friuli. The wines from these regions, most notably Gewürztraminer and Pinot Bianco from the former and Friulano and Sauvignon from the latter, are deeply concentrated with expressive aromatics and vibrant acidity. Campania is another great region for white wines in Italy; producers her work with grapes such as Greco (Greco di Tufo) and Fiano (Fiano di Avellino), varieties planted there more than two millennia ago by Greek colonists. Falanghina, a grape that produces a medium-bodied white with very good acidity, is another specialty from Campania. Carricante is a sleek dry white from Sicily, while Vermentino is a high acid white from coastal vineyards in Liguria and Tuscany. Also from Tuscany is Vernaccia di San Gimignano, an underrated dry white with melon and almond notes. Most Italian whites are aged in steel to preserve the aromatics. While some are best consumed young (with vegetable risotto or lighter seafood), many of the best examples (Greco di Tufo, Friulano) age for a decade or more from the best producers in the finest vintages. 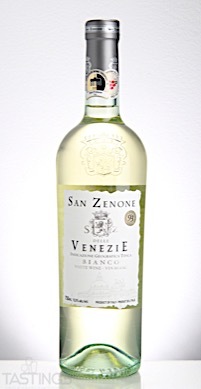 San Zenone 2016 Bianco, Delle Venezie IGT rating was calculated by tastings.com to be 86 points out of 100 on 9/29/2017. Please note that MSRP may have changed since the date of our review.